Pepco and Hubbell Lighting are pleased to offer the latest LED portfolio available in stock at multiple Pepco locations. The product offerings will serve as a benchmark for applications in Healthcare, Education, Commercial Office and Retail environments. The Columbia brand has been leading the industry with exceptional efficacy, optical performance and quality. Through this relationship we can offer a variety of Recessed, Linear and Surface application fixtures for your industrial applications. We also partnered to bring you comprehensive solutions for emergency lighting with the Compass brand. The Compass brand provides LED solutions that keep Quality, Value and Versatility at the forefront. Hubbell Lighting’s complete family of luminaires are dedicated to the latest solid state lighting and driver technology for optimal performance and energy efficiency. Be sure to visit the Hubbell Lighting website: https://www.hubbell.com/hubbelllightingci/en/ to experience the innovation, creativeness and exceptional solutions available today for all of your lighting applications. Don't forget to participate in this month's sweepstakes! Pepco and Eaton Cooper Lighting are pleased to offer the latest LED portfolio available in stock at multiple Pepco locations. The product offerings will serve as benchmark for applications in Healthcare, Education, Commercial Office and Retail environments. The Metalux brand has been an industry staple for over 50 years and offers a variety of Recessed, Linear and Surface application fixtures and a complete family of products for your industrial applications. Metalux’s selection of luminaires are dedicated to the latest solid state lighting and driver technology for optimal performance and energy efficiency. Pepco’s Lighting Team is here to support all of your requirements in a timely, efficient and professional manner. Contact your Pepco Sales Representative today for more information. Pepco and Klein Tools are proud to present the latest line up of multifaceted and patented magnetic track tools available. Creating flexibility and ease of use was a key objective in the design of these new tools. Adding the strength of rare earth magnets holds your new tools in place while in use, making your job easier. Going further, introducing a variety of multiuse tools minimizes the need for additional items in your tool bag. Be sure to check out the latest available Klein Bags to store all of your tools. Since 1857, Klein Tools has been manufacturing tools in America, and it’s as important for the Klein family to keep that tradition now, as it was more than 150 years ago. Klein isn’t just the name of the company; it’s also their family name, so they have to be proud of everything they make. Klein Tools continues to invest in U.S. manufacturing and is committed to maintaining its place as the favorite among electricians. Klein is the only major tool manufacturer worldwide focused on electrical and utility applications. No other manufacturer of hand tools and related products used in electrical applications makes more items in America than Klein Tools. We welcome the New Year by continuing our partnership with Eaton as our feature vendor and the launch of the Plug-On Neutral product offering. Available in both the BR and CH loadcenters, this is the first phase of transitioning over to an innovative, labor savings and competitive solution. Look for expanded product offerings in this portfolio of products in 2019. Additionally, Pepco and Eaton also feature the new Power Defense MCCB, expansion of the Power XL series Drives Solutions and the Motor Control Center, Motor Management Relay. Each solution provides the innovation, engineering excellence and global acceptance we have come to know with the Eaton product lines. The world's demand for power keeps growing! Today, the world runs on critical infrastructure and technology. Planes. Hospitals. Factories. Data centers. Vehicles. The electrical grid. These are things people depend on every day. And the companies behind them depend on us to help solve some of the toughest power management challenges on the planet. Eaton is dedicated to improving people’s lives and the environment with power management technologies that are more reliable, efficient, safe and sustainable. Eaton is a power management company made up of over 96,000 employees, doing business in more than 175 countries. Their energy-efficient products and services help customers effectively manage electrical, hydraulic and mechanical power more reliably, efficiently, safely and sustainably. By giving people tools to use power more efficiently. Helping companies do business more sustainably. And by encouraging each and every employee at Eaton to think differently about their business, communities—and the positive impact they can have on the world. We welcome in the holiday season partnering with Eaton as our feature vendor and the launch of the Plug-On Neutral product offering. Available in both the BR and CH loadcenters, this is the first phase of transitioning over to an innovative, labor savings and competitive solution. Look for expanded product offerings in this portfolio of products in 2019. Additionally, Pepco and Eaton also feature the new Power Defense MCCB, expansion of the Power XL series Drives Solutions and the Motor Control Center, Motor Management Relay. Each solution provides the innovation, engineering excellence and global acceptance we have come to know with the Eaton product lines. Don’t forget to participate in our sweepstakes this month! Pepco and Videcon are pleased to present the release of a completely updated product offering. We begin with the expanded offering in the recording capabilities. The Lite version provides a cost competitive, feature rich solution while maintaining quality. Our Professional series expands the capabilities for additional alarm inputs, recording up to 8MP, 4K UHD on all channels. Rounding out the offering is the Elite series boasting up to 50TB of storage capability and RAID 1/5 support. All recorders are compatible with our license-free iPIMS VMS. We expand the product offering with the addition of the “Aspect” brand. A complete range of cameras and NVR’s up to 64 channel including built in video analytics capabilities, and a feature rich platform. Make sure to check out all of the capabilities within this platform. Pepco and ABB are pleased to team up and bring you a unique view of our partnership. As our relationship has grown over the years, so has ABB’s diverse product offerings. In recent years, the many acquisitions ABB has embarked upon have created a global leader in our industry that includes products across multiple market segments that align us to strengthen our partnership in the future. Today, we present to you the key market segments that Pepco and ABB will jointly promote in an effort to provide complete solutions for all of your electrical and industrial requirements. Pepco compliments these multi-market product offerings with the highly skilled personnel staff to support and fulfill your most challenging project and application requirements. As our tag line states, “From Substation to Workstation,” we welcome the opportunity to show you how Pepco and ABB can be your one source for all of your electrical and industrial product needs. Pepco is pleased to partner with Crouse-Hinds and present to you a complete offering of Industrial LED Lighting Solutions. If you are looking to replace HID, the Crouse-Hinds IHB series provides you with a broad range of options. The PVM Series is a rugged, long life solution for the light industrial production and warehousing facilities seeking to increase maximum lighting efficiencies. We round out the solution with the Pauluhn and Champ VMV series for all of your heavy and harsh environments. While we feature the Crouse-Hinds Industrial Lighting platform, we must also keep in mind the complete line of Industrial Products for all of your harsh, hazardous, and adverse environments that are available from Pepco and Crouse-Hinds to enhance safety and reliability in your most challenging applications. Dating back to 1897, Eaton's Crouse-Hinds series products support safety in harsh and hazardous locations. Crouse-Hinds series electrical fittings and glands, motor control, panelboards and switches, enclosures, lighting, plugs and receptacles, and drilling and marine products are designated to NEC standards. Eaton also delivers Crouse-Hinds series explosion-protected electrical equipment that is designated to IEC standards, meeting ATEX directives. The Crouse-Hinds series is available worldwide and includes light fittings, emergency lighting, Ex-junction boxes and terminal enclosures, control stations, switchgear, cable glands, plugs and sockets, and safety switches. 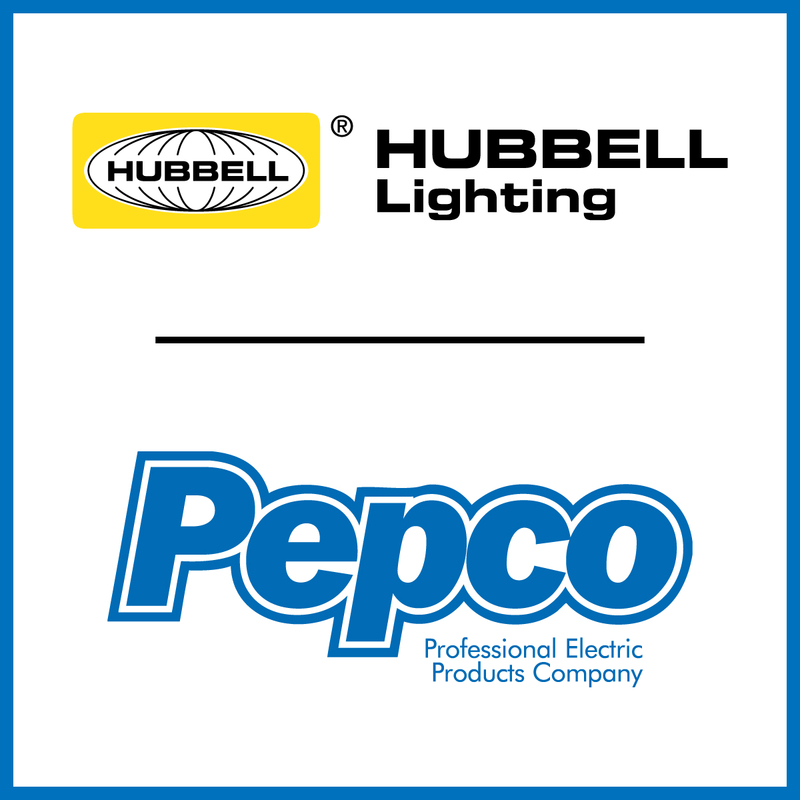 Pepco and Hubbell are pleased to team up and bring you a unique view of our partnership. Our history together goes back a great number of years. We have embraced the Hubbell Companies over the years as a key vendor across multiple disciplines. We are presenting to you the key market segments Hubbell and Pepco jointly share in an effort to promote a complete solution. As you will find, each market segment offers a broad range of featured products to complete your project. Pepco is uniquely positioned to provide the expertise and product knowledge to work through all of these requirements. We can add to this the ability to cross over multiple market segments and truly provide the end to end solution. As our tag line states, “From Substation to Workstation”, we welcome the opportunity that may be presented to show you that Hubbell and Pepco can be your one source for all of your product needs. Serving Our Customers means listening to our customers, understanding what they expect and helping them be successful. We do this by developing long-term relationships and building confidence in Hubbell’s ability to create and support opportunities to achieve their goals. Operating with Discipline is a core attribute of our lean operating philosophy. Taking waste out of the process, replacing it with value-add functionality, and helping our customers connect with Hubbell in a mutually beneficial way.